Cook and drain pasta as directed on package. Rinse with cold water; drain. In large bowl, mix pasta, chicken, grapes and onions. In small bowl, mix mayonnaise, milk, mustard and salt; stir into pasta mixture. To serve, place 3 watermelon wedges on each of 6 dinner plates. 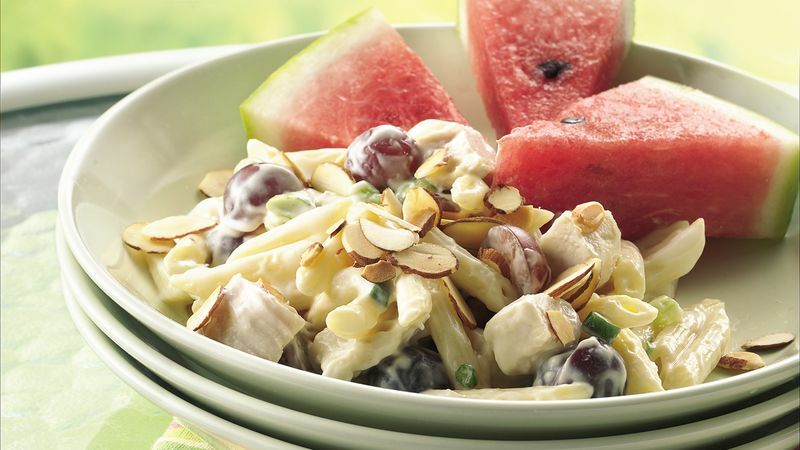 Divide salad evenly among watermelon wedges. Sprinkle with almonds. *To toast almonds, bake uncovered in ungreased shallow pan in 350°F oven 6 to 10 minutes, stirring occasionally, until golden brown. The pasta salad can be made ahead and refrigerated. Arrange watermelon wedges with the salad just before serving.